Edmund Burke [Irish orator, philosopher & politician 1729-1797] famously remarked that “All that is necessary for the triumph of evil is that good men do nothing.” Over the years we have seen many men & women of ill-repute, people who are devoid of even a modicum of morality or justice, the corrupt and those without any sense of duty to our nation systematically weaken the foundations of our nation. Many good and honest Malaysians have despaired for the future. So often I am asked whether Malaysia even has a future. My reply is always the same: for so long as there are a few good men and women, there’s hope! Lately, the few good men and women in our judiciary, have been making themselves heard by standing up for justice, the rule of law and our constitution. They have affirmed, in no uncertain terms and at great costs to their own careers, the primacy of our constitution vis-a-vis the Syariah court system [See attached Malaysiakini article: Judge rules civil court superior to Syariah concerning]. They have done what our spineless politicians have been afraid and unwilling to do; they deserve our admiration and respect. And because there are the few good men & women who refuse to keep silent in the face of injustice, evil will not triumph in Malaysia. And I believe that every time a good man or woman takes a stand, it encourages and inspires other good men and women to stand up and be counted as well. Let the good men and women arise and reclaim our nation and the dream that is Malaysia! The civil High Court has a higher jurisdiction than thesyariah court on the religious dispute of a spouse who does not convert to Islam, the High Court in Ipoh ruled today.In giving convert father KPathmanathan @ MuhammadRidhuan Abdullah one week to return his six-year-old daughter to the non-Muslim mother, M Indira Gandhi, the court also found the father guilty of contempt.Judge Lee Swee Seng said failure to hand over the child would require the police to enforce a warrant of arrest on Pathmanathan for committing contempt and not abiding by the court order. He had earlier rejected an application by Pathmanathan’s lawyer, Anas Fauzi, for a six-month stay on the contempt order and ordered that the child be returned within a week. In a landmark decision last year, Justice Lee overturned the conversion to Islam of all three underaged children of Pathmanathan and Indira. The granting of custody to the non-Muslim mother today is the second in less than two weeks, after the High Court in Seremban granted S Deepa custody of her two children. 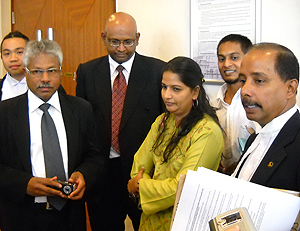 Deepa’s convert husband failed to get a stay order from the Court of Appeal.